I was in school earlier today, to read a book to my 6-year old and gathered every other child whose parent did not turn up. I guess, a working parent would understand this situation and can empathize better! Also, because I cannot go every Wednesday, the scheduled time for book reading with parents. Its always a special day, for both me and my son, when I do actually make it. 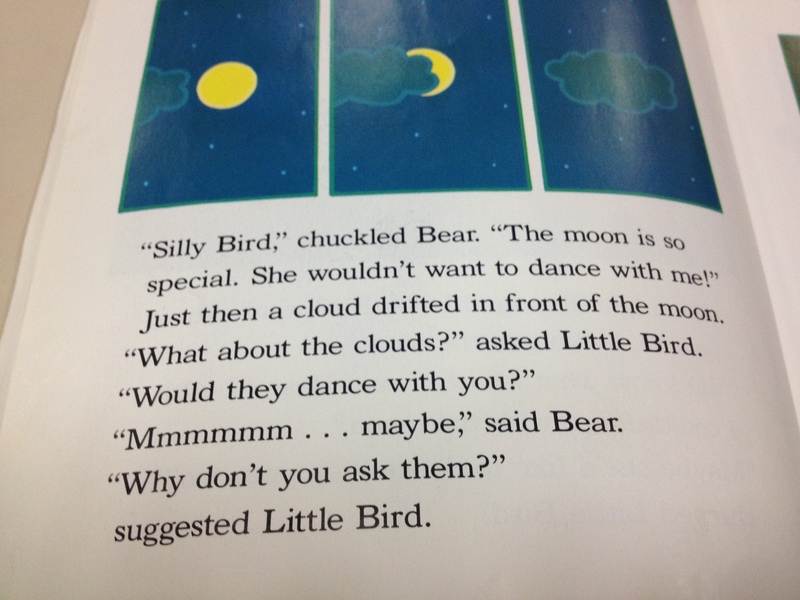 We read many books, as I read out each child’s favourite who gathered around the table, but the one I liked most was about Mr. Bear who wanted to dance with the moon. Mr. Bear was afraid to ask, because the moon is ‘so special’. The book then shows you how little Mr. Bird suggests to him to try. After all, how would he know if he never tried! Wasn’t that a nice reminder to start my day with! We want all the wonderful things to happen in our lives, but sometimes, the sheer wonder of our awe-inspiring dreams make us hesitant to even try. ‘Too good to be true‘, we check our thoughts. But as wise little Mr. Bird reminds us, we should always make an effort and take the first step. How else would we know it will not work if we never try? Moral of the story: it works when you ask!